Jay Douglas and Terry Telford recently recorded a tell-all TeleClass that showed attendees how to create and produce high performance sales videos for their websites. The following excerpts were taken directly from the TeleClass. So whats actually on the video? Is it a really quick summary of what would be on the sales letter? Whats the content there? Well basically I tell them what Im going to tell them, tell them, and tell them what they have to do to take action. Ill go over the sales letter and see what the features are; Im not worried about the benefits. In traditional copywriting, they tell you to tell them what the benefits are; youre going to have a lovely home and youre going to get all the things you want in life and blah, blah, blah. Well, look, I have 60-90 seconds and Ive got to tell the people, look, this is what youre going to get with this product, this is what its gong to do for your business, this is what its going to do a, b, c, d, youre going to get this and this. It is a short, tight synopsis of what is on the sales page. Then people can look at the video and say, you know what, Im really interested in this, Im going to read the sales letter to get more information about this. Then you have a really targeted person that is on your web page. They see the video and you do your 60-90 second schpeal and well, theyre not going to read the rest of the sales page. And my point is, they probably wont reach your sales page anyway; for the most part, people are getting away I believe from these 30, 40, 50 page long sales letters that talk about, I call it obnoxious things, like Im going to blow your socks off. Its unbelievable, its not credible and people dont have time for it. You know what Jay? This just blows my socks off! Because part of what I do is copywriting, so from a copywriting standpoint, I always sell in the benefits, I sell the sizzle, not the steak. What youre saying goes completely against my copywriting training: dont sell the sizzle, sell the steak. So in a video, youre doing the absolutely opposite, focusing on the features instead of the benefits. Youre doing it opposite to what your sales page is doing. Thats true, and Ive done for example, videos for major copywriters like Mike Fortin, the copywriting king, but the videos that Ive done for him have all been in the vain that I told you. I talked features, what youre going to get, what this is gong to do for you, whats the bottom line, what am I getting at? Thats what people want to know in the 60-90 second realm. Now, as I said, once they watch your video, then they become qualified; well, yeah, Id like to get some more information on that. Theyll either bookmark your page or sit down and read it right then and go through that 10, 15, 30, 40, 50 page letter at their leisure because now theyre really interested in what you have. But if you come off with a video that says oh, were going to give you the lifestyle that you want and youre going to be walking the beach with 15 Tahitian girls, they dont want to hear that. That video is not going to sell, guaranteed. Then the actual purpose for that video is not necessarily to sell the product, but to draw people into the sales letter; your video is actually acting as a surrogate headline. This is true. This is true. And actually, we started testing videos that are on a squeeze page and they say, heres the video, heres the headline, heres the sub-head; and its either got an order button or a sign me up for more information button. Thats it. Wow, so you just eliminate all the copy and have the video do all that for you! Yes, and we found this, believe it or not, very effective. The reason is, that people dont have time, theyre too busy, or the baby starts crying; the phones ringing; people have short attention spans. Hit the video, they say oh I like that or I dont like that, and youve got a really targeted person coming out of that funnel. Thats fantastic. So basically, the videos can be the summary, same procedure or the same purpose as what the headline would be. If you combine a 60-90 second video at the top of your web page, then continue on with your regular copy; for anyone whos very detailed oriented can go ahead through the copy, but basically that videos going to sell for you. People are getting to scroll down to the order button, theyll read the copy or theyll disqualify themselves and hit the back button. Excellent. I think what we should do Jay, before we go on down the vein of the actual purpose and what the video is doing for us, maybe we can backup and get a little bit more technical and look at what kind of software, and hardware we need to get this video going. Lets look at the hardware first; what do we need hardware-wise? Obviously you have to have a computer and if it has Windows XP on it [I dont know anything about Macintosh so Im speaking only to the Windows people and I hope that doesnt tick some people off that are on the call], but Im a Windows guy. Windows XP, you already have the software on your computer that you need to make videos and its called Windows MovieMaker. It is almost like a step child of the Camtasia Studio Suite. Camtasia Studio, its a $300. program; that will do a little bit more than Windows MovieMaker but Windows MovieMaker is a free program and has a phenomenal set of capabilities, its pretty straight forward. Once you get in there and start playing around with it, youll see its quite easy. When you first open it up any program, it looks a little bit daunting if you dont know what youre doing; youre not familiar with it. Get in there and play around with it a little bit, youve got everything you need right there. The only other thing you really need to start making your own videos is a microphone and there are three kinds. There is the desktop microphone you can move around on your desktop, the headset microphone and then whats called a Lavaliere microphone. Of course the headset is just strapped on your head with the earphone and a little mouthpiece. The Lavaliere is what you see the newscasters wear on TV, NBC, ABC news; they have a little tiny black microphone thats clipped right on their shirt or blouse. When they talk, it picks up really well. You can get it at a place like Radio Shack for $10, $15, $20. I recommend the one with the headset with the boom microphone on it. Something from Plantronics is a good buy; also Logitech has good microphones like that. Once you have the microphone, speak into it, Im just talking about doing what they call Screen Capture Videos. That is, you can combine things that you put up in PowerPoint, still photographs, you can even combine moving video, live video into it. But thats all the equipment you need to make what I would call Screen Capture Videos. Now of course if youre going to make a live motion video then youll need a video camera. One of the biggest fallacies that Ive discovered when 99 of people talk about lets make videos, they think automatically, Ive got to stand in front of a video camera. Thats not the case. 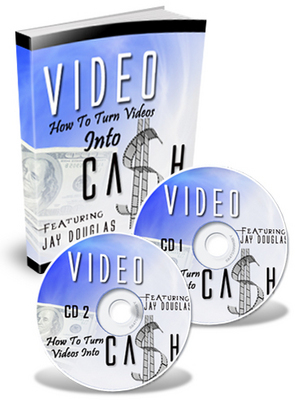 If you want to do that you can, but if youre going to be producing your own video, then of course youre going to need the camera, but there are massive amounts of video on the internet you can purchase; you never need to touch a camera. You can purchase the raw video; if you want a video of a fireman or a video of a mother with a child, or whatever video you want; you can combine that video with your still shots, with your graphics, with whatever you want to say, and put those in a Screen Capture type of video and do very, very well with it. Okay, so we really have two different ways of going about things and almost a third way with a combination. We can go into Screen Capture Video, where everything is done right on the computer, we dont need the video camera. Or, if I want people to actually see what I look like, and I want to sit there and talk for a few minutes, I can record myself on my video camera and then I can use that. Then, somewhere in between, I could combine it so you can see what I filmed on my video camera combined with a PowerPoint and some stock video, is that right? Thats right. Hang on a second, is that my competition I hear breathing on the phone? Im just kidding. Let me tell you this though. There is a caveat. Even if you buy a camera, if you get in front of it and youre not you know, some people can sing but they should only do it in the shower. My partner, John Ward, whos in Scotland, is very, very good in front of a camera, hes a natural; some people could get on video, you just point a camera at them. But if you are not photogenic or dont come across well, you can do yourself more damage trying to get on the video yourself than if you just went on and went with the screen capture we talked about earlier. That is one point to consider. I think this way, youve either got it or you dont. When you come across on camera youre trying to sell the audience and if you just dont come across well; no disrespect, some people just dont look good on camera, they dont come across well, they dont get that good feel, then you shoot yourself in the foot before you ever get started. Do you see what Im saying?